In her post on Seed Buying -- Method or Madness?, Carol at May Dreams Gardens asks, "What type of seed buyer are you?" Most of my garden is planted from seed and I have built up quite a collection of seeds over the past three years since joining the community garden. In fact, my seed stash runneth over! Following are my replies to Carol's questions about seed buying addictions habits. Do you carefully read all of the seed catalogs sent to you and then browse the Internet to compare and contrast all the options, then decide which seeds to buy? I carefully comb through all of the catalogs to look for certain seeds I know I want to buy, and also just for the fun of discovering new (or new-to-me) plant varieties that might be interesting to try. I'll compare options from various catalogs and then go online to place my order. I don't usually go on the Internet to browse for seeds (unless I'm looking for something very specific). I like to page through catalogs first and then go online to buy. Do you buy seeds from 'bricks and mortar' stores and get whatever appeals to you as you are browsing? Yes. And this is a weakness! 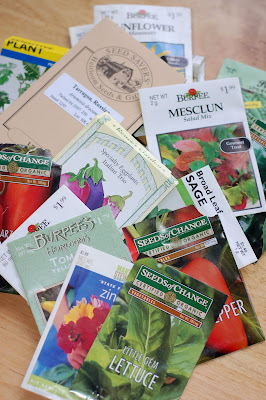 I buy seeds online, but pretty much every time my husband and I stop at the gardening store to get supplies (not seeds), I pass by the seed racks and there is always something tempting. I usually think, I'll just get one or two packets of something, but then it turns out to be three or four (or more). Do you buy vegetable seeds in bulk where they scoop them out of seed bins, weigh them and put them in hand-marked envelopes? I've never seen this as an option. Do you buy seeds for just vegetables, or just annual flowers? Do you buy seeds for perennial flowers? 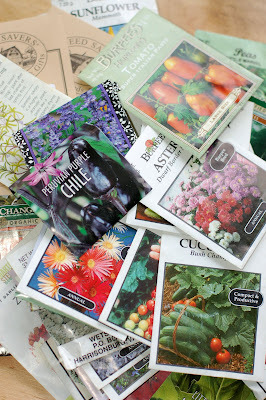 I buy seeds for vegetables, flowers and herbs. It's very rare that I buy perennial seeds. I think it's because I am not patient enough to wait until the second year for a bloom. Do you know what stratification and scarification are? Have you done either or both with seeds? I've done stratification and scarification, but I didn't even realize that's what the processes are called. I've used stratification (cold treatment) for lavender seeds. And I've used scarification (cutting/scratching seeds to loosen the skin wall) for moon flowers. Do you order seeds from more than one seed company to save on shipping or buy from whoever has the seeds you want, even if it means paying nearly the same for shipping as you do for the actual seeds? I buy from whomever has the seeds I want. It's usually not more than two or three companies per season. I get a lot from Seed Savers, Seeds of Change and the local American Plant Food Company. Another local gardening center each year donates to our community garden association a giant bag of its unsold seed inventory from the previous year. Those seeds are free to members of the community garden. I've accumulated a lot of seeds this way! Do you buy more seeds than you could ever sow in one season? I wouldn't say I buy more *new* seeds than I could ever sow in one season, but, over the years, I have accumulated a seed stash that, in its entirety, contains much more than I could ever use in one year in my small plot. I have trouble throwing old seeds away. Do you only buy seeds to direct sow into the garden or do you end up with flats of seedlings in any window of the house with decent light? Both. I start some seeds inside under grow lights. My husband and I get a head start on planting our summer vegetables this way, and it also helps with slow-growing seeds like lobelia. Other seeds -- flower seeds such as celosia, sunflower, cosmos, and zinnias -- will be direct sown into the garden. Do you save your own seeds from year to year and exchange them with other seed savers? I don't save many of my own seeds, but I have saved some -- and each year I do a little more. Because of the limited space in my plot, I sometimes get impatient about waiting for a plant to go to seed. I'll end up pulling it out and planting something else to maximize use of the space. A few of my seed-saving intentions were thwarted last season because I just couldn't wait for the plant to get all the way to seed. Do you even buy seeds? Yes. My husband and I buy seeds for almost everything we grow in the garden. We only buy plants for some of the things that are more difficult to grow from seed -- such as rosemary and tarragon. Do you have a fear of seeds? Some gardeners don't try seeds, why not? No, I don't have a fear of seeds. I know that sometimes starting from seeds can be risky in that the seeds may not germinate well or the young plants may not survive if they are not hardened off well when they go into the ground. Seeds obviously take longer than starting from plants, but I get a great deal more satisfaction from starting with seeds than I would if I were to just buy a plant and plunk it into the ground. There's a real nurturing aspect to working with seeds -- seeing the first tiny sprout and watching it grow up to a mature plant that bears a flower and/or vegetable. Growing from seed takes more work and care, but I find it very rewarding. Do you understand seeds? I once bought seeds at a Walmart in January (Burpee Seeds) and the cashier asked me, "Do these really work? Yes, they do. "Isn't it too cold to plant them now?" Well, yes, if you are planning to plant them outside. I don't think this cashier grew up around anyone who gardened. I don't *fully* understand seeds in terms of how they work and how all the genetic stuff inside of them eventually turns into a plant (note to self: learn more about that! ), but I do know that if I put seeds in seed-starting mix, add water and light, and pay attention to the growing instructions that came with the seeds, I'll generally do all right and get a plant. It's usually just a matter of learning what the seeds require, following the directions, and then (hopefully) having the right conditions for the thing to grow. It is, of course, more difficult to control those conditions when direct sowing outside, but I've learned to just give it a whirl. Some seeds will make it and thrive as healthy plants. Others might seem to have the best conditions and then end up doing nothing at all. That's just how it goes sometimes. Very often the garden I envision at the beginning of the season is not the garden I end up with in the end. There are always surprises (good and bad) and I think that's what keeps the garden challenging, interesting and fun. Do you list all your seeds on a spreadsheet, so you can sort the list by when you should sow them so you have a master seed plan of sorts? I use a couple of books to help me remember when to plant certain seeds. 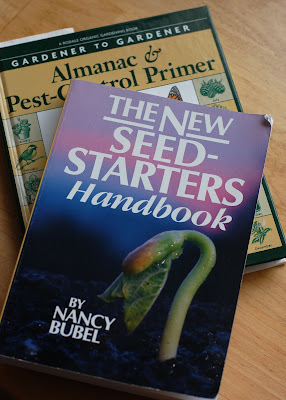 My favorites are The New Seed-Starters Handbook and the Gardener to Gardener Almanac & Pest-Control Primer. I'll periodically go through my seed stash and group seed packets together, making a mental note of which groups of seeds need to go into the ground by a certain date. Sometimes I'll make a note on my calendar (plant X vegetable by Y date), but I never use a spreadsheet. 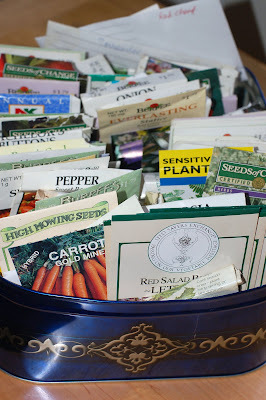 Do you keep all the old seeds and seed packets from year to year, scattered about in various drawers, boxes, and baskets? Oh, yes! I have seed packets crammed into an old cookie tin I keep in the closet during the winter. I probably still have seeds from 2001 or 2002 in there. I really need to go through everything and get rid of the oldest ones. Good weekend project. Do you determine germination percentage for old seed? No. Never. If I plant old seeds, I just expect that the germination rate isn't going to be as good as with fresh seeds. I know that some seeds stay viable for longer periods of time than others, so I usually just experiment. If I plant old seeds and a few of them grow -- great! If they don't grow -- well, I took my chances. Thanks for posting your answers. I am impressed by the seed sowing abilities of so many of the garden bloggers. And I admire you looking for seed 1st, before you buy plants. That takes patience. Anita (and any others who haven't been able to leave comments), I am sorry about the Blogger problems. Sometimes I can't even put up posts when I want to because the service is down for maintenance or whatever. It's frustrating.